Have you visited Downtown Huntington Beach lately' Main Street Huntington Beach Shops, Stores and Restaurants in the Huntington Beach Downtown Business Improvement District provide a place to wander, shop, eat and soak up the sun. The 100-year old Main Street in Huntington Beach offers an ambience you'll find in other cities and towns along the coast, but with its own special flavor. While things may change some day, you can still drive down Main Street through the heart of town, park along Main Street, walk after dark and enjoy Huntington City Beach nearby. Main Street is a friendly, fun place. 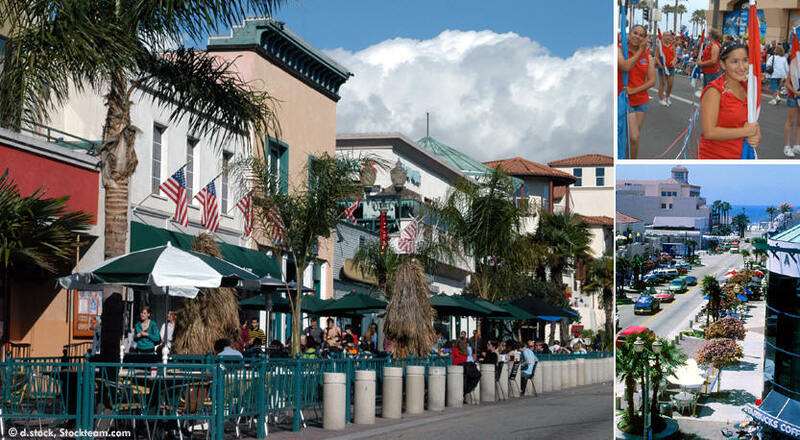 From the shop owners to food servers, the sunshine and small town atmosphere make Huntington Beach's Main Street the perfect place to wander and enjoy an hour or day. Welcome to Main Street USA, the place that tourists and locals love. What's there to see on Main Street' Surfboard suited dudes and bikini clad girls. What's there to do on Main' Eat sushi, eat a burger, eat an fish taco or have a pizza, then enjoy some bubbly drinks. Shop in contemporary, youth-oriented clothing stores, surf stores and boutiques. The clothes are geared toward the casual beach lifestyle. Formal attire isn't a big selling item downtown on Main. Look for swim trunks, bikinis, jeans, tanks, purses, shoes, flip flops, sandals, and anything casual. Surf City Nights Tuesdays - 5-9 p.m.
Huntington Beach Pier is the anchor to Main Street shopping and dining. There are hundreds of places within the city and nearby in Huntington Beach, which features warm, sandy beaches along the Pacific Ocean, beckoning tourists to play. This safe city has the longest municipal concrete pier in California, 8.5 miles of smooth sand, mild climate all year long and some of the best surfing waves in the United States. With natural beauty reminiscent of the Hawaiian Islands, over 11 million people are drawn each year to this Southern California location. What you will find are 50 places to dine: Main Street Dining List Main Street Huntington Beach, Surf City California USA. Surf City Nights - EVERY TUESDAY! SCN offers free family entertainment, Farmer's Market, outdoor food booths, and street closure of the first several blocks of Main St. This popular outdoor entertainment for tourists and residents of the local area who enjoy the warm nights in Huntington Beach includes activities for the kids (including Video Game Theater,) specials from downtown restaurants and sidewalk sales from retailers all take place on Main Street between Pacific Coast Highway and Orange Avenues. Huntington Beach Downtown BID continues to present great entertainment and events throughout the year. In the works are some exciting special weekend celebrations to be held in addition to the Tuesday Surf City Nights weekly event. Surf City Nights is held each Tuesday from 5 to 9 p.m. Location: Main Street between Orange and Pacific Coast Highway. Due to county health regulations, dogs are not allowed. Surf City Nights Tuesdays evenings! Where: Main Street, 1st - 3rd blocks between PCH & Orange, Huntington Beach, CA 92648. When: 5 to 9 p.m. Cost: Free. Getting there: Take San Diego Freeway (405) Beach Blvd. exit. Drive toward Huntington Beach, not Westminster. When the street comes to an end at Pacific Coast Highway, turn right. Main Street is just a few block north at the stoplight of Pacific Coast Highway and Main Street. Parking is available in beach lots, three downtown parking structures and metered street parking along Main. For meters, bring lots of quarters. Jimboy's Tacos, The Strand 120 5th St.